It was an almost two hour simulator session and I was flying a Piper Seneca or PA-34. It’s my first attempt at controlling a twin. That alone had created some challenges as managing manifold settings below the redline and balancing power was a unique experience. It’s supposed to be second nature. In the meantime, I’ve got to think about power issues while balancing the props and flying on instruments accurately. I was put through my paces for an hour flying the approach and missed approach to Bloemfontein (FABL). All was going fairly well until the last segment which put me back over the airspace above Lanseria. I’ve flown this leg on sim as well as under the hood and generally flew safely without any major hiccups. Even the break-cloud and ILS approach while sometimes a little high, was not an outright fail. That unfortunately changed when I flew on ADF alone. The VOR was disabled by CFI Russell Donaldson and I was forced to fly the pattern without GPS or VOR – aiming at Lanseria’s NDB known as Lima Alpha or LA. Because I have not used the ADF as a stand-alone instrument for months, I confused a few things. 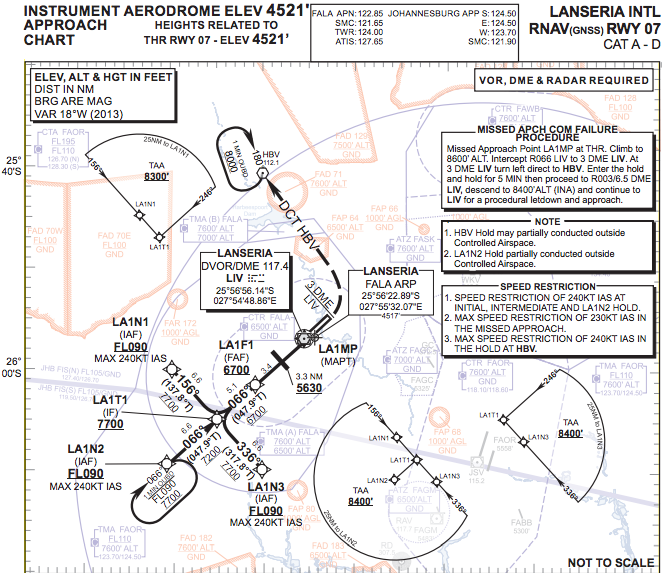 Lanseria RNAV courtesy of CAA. All appeared normal until I was 3.1 nautical miles from LA. Then the DME remained unchanged for a minute. I thought it was Russell purposefully throwing another curve ball to add a little more spice to the instrument flying recipe. But all was not normal. I had turned north instead of remaining on track and had actually begun to ignore the ADF in favour of the broken VOR. What compounded my confusion was the fact that the red error flags had been removed as it tended to obscure the Artificial Horizon. to control that I would have to reset my approach and do the entire approach again. Instead I thought I’d wait another minute just in case the DME kicked back into life. By the time it was clear I was now heading north and was over 8 nautical miles away from the beacon and on my way to Thabazimbi. 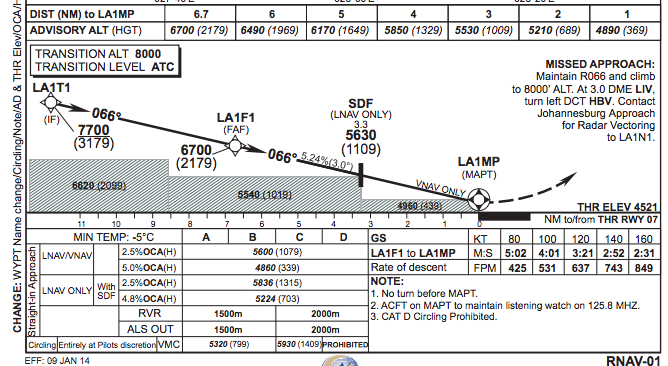 Altitudes and reporting points, FALA. 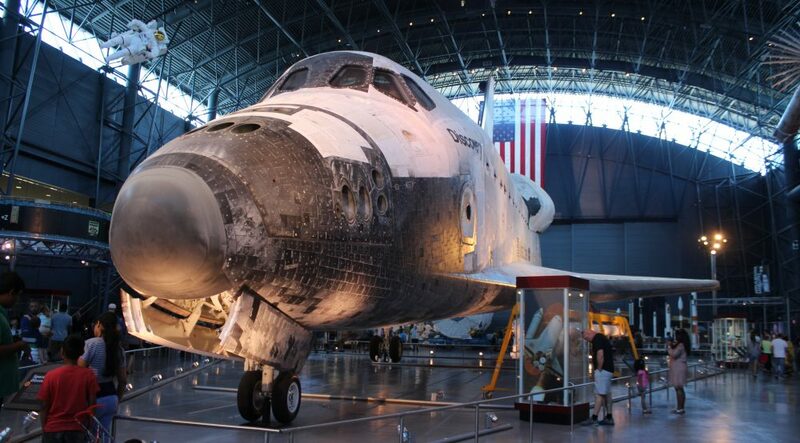 But the experience convinced me that while I was practicing flying on instruments, I was unable to properly process a restricted instrument panel. Not that the plane was in danger – unless fuel became an issue. So its back to the drawing board with my copy of X-plane. When I next train on instruments (probably this weekend) its going to be on a limited panel and only on ADF for part of the training to imbed the logic and practice efficiently. It may be true that the NDB’s are being allowed to “die” as the technology is replaced by GPS. Still, aviators know that mantra. Use all tools at your disposal in order to ensure survival. Yes, I have backup technology. I have a hand-held Garmin (about to upgrade to an iPad) for GPS navigation, but its still not good enough. More practice please. 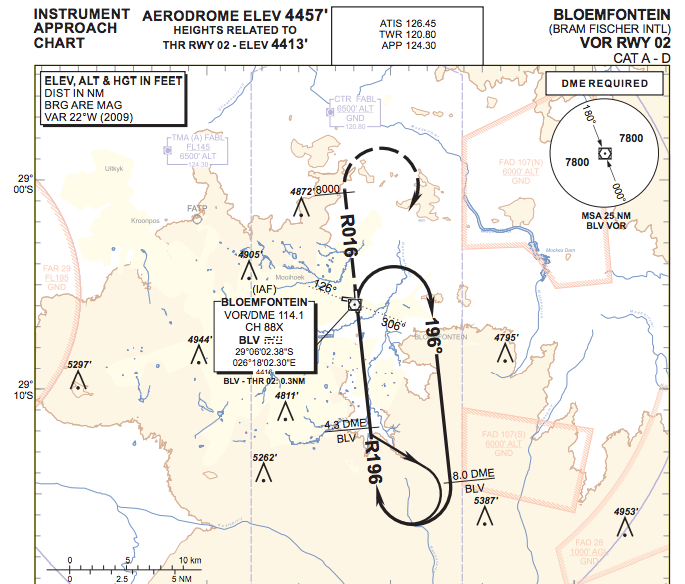 This entry was posted in Uncategorized and tagged ADF, Bloemfontein International, Cirrus, DME, GPS, Lima Alpha, MAP, NDB, Piper Seneca, VOR by desmondlatham. Bookmark the permalink.